The ODBC pane of the database connectivity dialog provides database access to different database systems, which have ODBC data sources configured on your computer. Use this pane to connect to a number of relational databases such as SQL Server, Oracle, MySQL, DB2 and many others. The tree of ODBC drivers located on the left side of the ODBC panes shows all the ODBC data sources available on your computer. Use the "ODBC Data Source Administrator" from your computer's Administrative tools to create new and modify existing ODBC connections. When you create (modify) ODBC data source after the TARGET component(s) installation they will not appear in the tree automatically, please press F5 of "Refresh" from the context menu to update the tree. The following picture outlines the basic elements of the ODBC pane. ODBC data sources are located on the top level of the tree. An ODBC driver specific dialog may appear when you try to connect to a new database. Expand the tree nodes to get to view the tables and views for the selected ODBC data source. The list in the middle of the pane shows all elements for the currently selected tree item. The field structure is shown in the field list when a table or a view is selected in the table list. This user friendly feature allows to make sure that you are looking at the right table without even opening it. 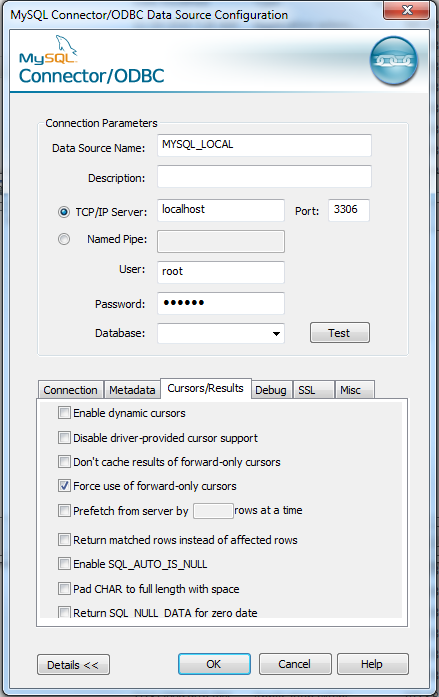 For connecting to MySQL via TextConverter we recommend using the ODBC driver provided by MySQL. YOU MUST INSTALL THE 32 BIT DRIVER. 2.) In order to properly set up the driver on a 64 bit machine you need to explicitly configure the 32 bit version of the ODBC driver by calling %windir%\syswow64\odbcad32.exe. a. Once you have configured the MySQL ODBC data source you can select it in TextConverter via the ODBC tab in the open data source dialog. i. 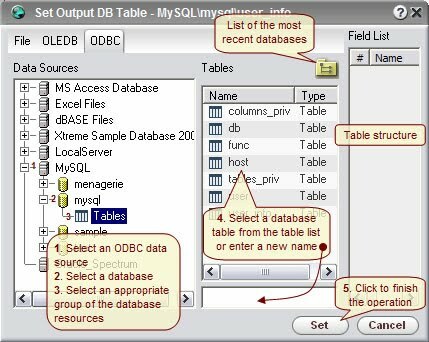 IF the MySQL data source does not appear in the list on the ODBC tab, hit F5 to refresh the list.